Conundrum was born 25 years ago, and today it still stands for doing things your own way and daring to explore. 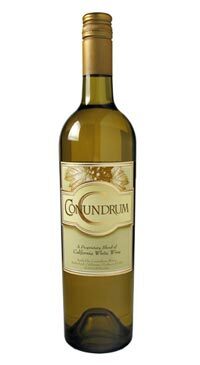 The exact blend remains under wraps, but every vintage the company includes Chardonnay for its weight and complexity, Sauvignon Blanc and Semillon for crisp acidity, Muscat Canelli for floral qualities and Viognier for lush texture. Taken together, they add up to a wine that rsquo;s amazingly versatile, pairing well with everything from salmon to spicy food, or enjoyed on its own as an aperitif. A beautiful light hue, this wine opens with the evocative scents of apricot, pear and honeysuckle, as well as bright notes of orange and lemon meringue pie. The entry on the palate has a subtle sweetness immediately balanced by a natural acidity and pop of freshness. Flavors of peach, apple and citrus are layered with with a touch of oak that comes from our use of barrel fermentation for a portion of the wine. The finish is long, with distinctive hints of each varietal creating a final, lingering impression.